EDGEFIELD, S.C. — Dictionary.com defines courage as the quality of mind or spirit that enables a person to face difficulty, danger, pain, etc., without fear. 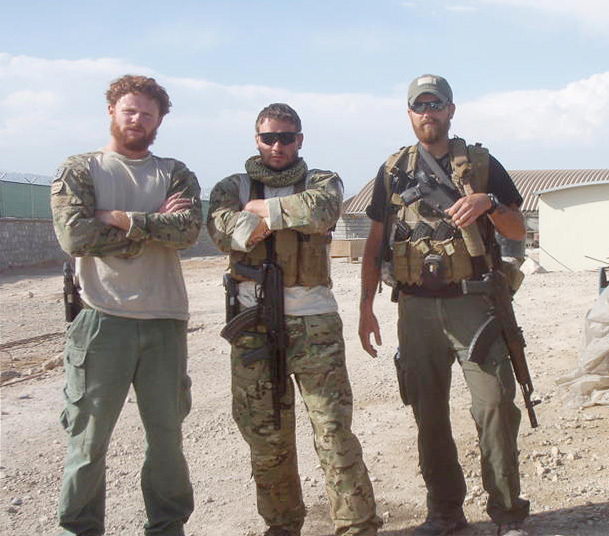 Chris Fleming (pictured right) worked as a government-contracted security consultant near Jalalabad, Afghanistan. Courage was the first word that came to Chad Franklin's mind describing his friend, Chris Fleming. The story of how the two met began in the war-torn area of Jalalabad, Afghanistan, where Fleming, from Collinsville, Ill., worked as a government-contracted security consultant. One day in June 2009, Fleming was riding in a convoy when his vehicle was blown to pieces by an improvised explosive device. "One minute, I was riding down a road in the front seat and the next I was lying in the bed of a different vehicle looking up at a buddy of mine as I coughed up blood," said Fleming. "I had to go a long way to get help. I ended up flatlining from respiratory failure and everyone thought I was dead. I woke up in an Army helicopter that was airlifting me to get help." Fleming's lower body wounds were so severe that both his legs were eventually amputated just below the knees. With devastating injuries and a long rehabilitation process ahead of him, many people in Fleming's position may have given up hope for an enjoyable life. Not Chris Fleming. "I was a Marine for eight years and my wife served in the Navy for four years," said Fleming. "In our family, there is no such thing as moping. I have a 1-year-old son and I don't want him to see me mope." A few months after suffering his injuries, Fleming, an avid hunter, was looking for a way to enjoy the outdoors. His search led him to the National Wild Turkey Federation's Wheelin' Sportsmen outreach program. The program helps people with disabilities enjoy hunting, fishing and shooting sports and is popular among injured military veterans and mobility-impaired people who love the great outdoors. After becoming a Wheelin' Sportsmen member, Fleming met Chad Franklin, an NWTF regional field supervisor, and his father Gary. At the NWTF's Illinois State Chapter Banquet, the elder Franklin approached Fleming with a once in a lifetime offer. "I felt like God brought Chris into my life so I could help him recover, so I asked Chris if he'd like to go elk hunting," said Franklin. "I knew that the thought of a physically demanding hunt for a majestic animal like an elk would help motivate him to work hard as he rehabilitated his body." Elk typically inhabit steep, rocky and vast terrain and hunting the magnificent animals can present anyone with a physical challenge. Fleming didn't let his two brand-new prosthetic legs influence his decision. He told Franklin that he'd do everything in his power to prepare his mind and body for an elk hunt. Fleming's positive attitude compelled the elder Franklin to purchase an elk hunt for his new friend that was valued at more than $9,000. After several months of intense therapy and preparation, Fleming boarded a plane on Dec. 13 and flew to New Mexico to embark on the hunt of a lifetime with the younger Franklin as a guide, and an NWTF cameraman along to record the adventure. For three days, Fleming, Franklin, guide Jeremy Walker and the videographer trudged up and down the steep hills prevalent to the Datil, N.M., area. The dedicated hunting party saw many elk, but were unable to get Fleming close enough for an ethical shot with his black powder rifle. Each night, the hunters returned to camp tired and empty-handed. Fleming's injuries amplified his exhaustion. "We would come back from a long day of hunting and I could tell Chris was in pain from the hiking," said Franklin. "He would remove his prosthetic legs and we could see he was blistering and bleeding. He never complained once though. That's not Chris. He doesn't complain about anything." As twilight approached on the fourth day, Franklin and Walker located a huge bull elk and helped maneuver Fleming into position for a shot. His heart pounding with nervousness, Fleming gazed through his scope at a massive, 850-pound bull that stood several hundred yards away. He slowly squeezed the trigger and missed. Realizing he'd shot over the giant elk, he adjusted and fired a second shot. The guide's excited scream confirmed a good hit, but the big bull disappeared from view, and left an exhausted Fleming to wonder about his shot. Without the strength and energy to hike to the elk's position, Fleming waited patiently as Franklin and the rest of the hunting party moved out of sight and attempted to recover the trophy animal. For almost two hours, Fleming waited with anxious anticipation for the others to return. 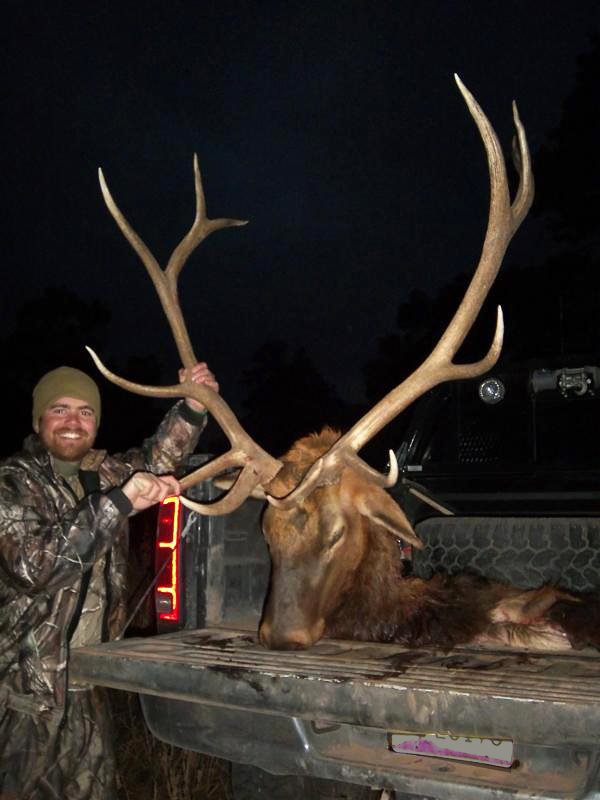 Chris Fleming was all smiles after he harvested a beautiful, trophy-class bull elk in New Mexico. "After a while, I looked up and saw Greg Darnell, the cameraman, running toward me and telling me to get ready," said Fleming. "He started filming me as I looked behind him and saw Chad and Jeremy marching into view. Jeremy had the cape and giant antlers of my bull strapped to his back. I was almost in shock. We gathered around the elk and celebrated. It was unbelievable." "It's hard to express how exciting that moment was for all of us," said Franklin. "The smile on Chris's face as we walked toward him with his incredible elk was priceless. I think he smiled for two days." Fleming's bull unofficially scored 330 - a true, trophy-class elk. After taking time to celebrate, Franklin informed Fleming of a surprise. Little O's Taxidermy Shoppe in Odin, Ill., had offered to donate taxidermy services to preserve Fleming's trophy forever, a process that can cost nearly $1,000. "After everything slowed down that night, I had time to look back on what we had accomplished," said Fleming. "The hunt was a tremendous help to my confidence and showed me that even with a disability, I can do anything if I put my head down and drive hard." Fleming is quick to point out that the hunt may never have turned out so perfectly without a lot of help from the NWTF and a few generous and selfless people. "Gary Franklin, The Illinois State Chapter of the NWTF, Van Hale Trophy Outfitters, Blake Pazero with No Bull Trophy Hunts and Little O's Taxidermy Shoppe each helped make my dream come true," said Fleming. "During the hunt, if I hadn't had the support of Chad, Greg and Jeremy, I would have given up by the second day. I had so many people backing me that I couldn't let them down." "I'm so glad I got to experience the hunt with Chris," said Chad Franklin. "He's an inspiration to be around. His positive attitude in the wake of a tragedy reminds me how much people take for granted." The incredible footage from Fleming's hunt will air on the NWTF's "Turkey Call" TV show on the Pursuit Channel the week of March 14. Pursuit Channel is included in the basic subscription package offered by DIRECTV (Channel 608) and its inclusion in DISH Network's basic subscription package (Channel 240) is almost complete.